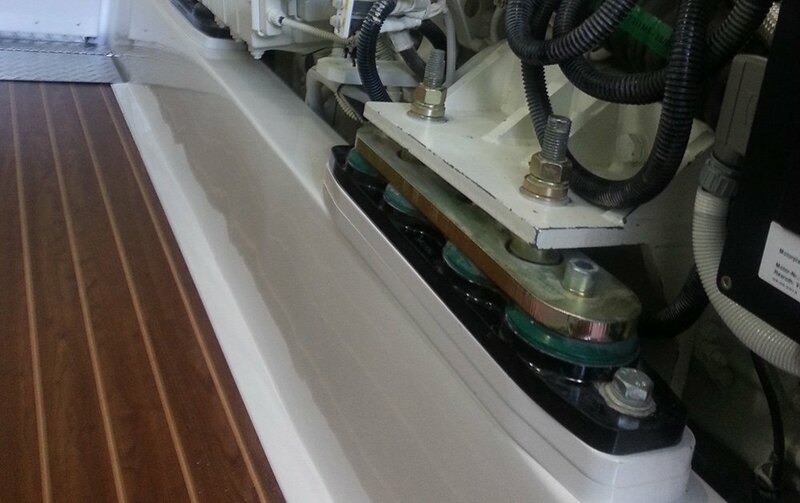 When it comes to vessel maintenance, one of the most overlooked parts is the relatively basic engine mount. While there many not be anything glamorous about it, this humble component has a serious job in the engine room: it is the single connection between the engine’s power and the vessel’s hull. It makes sense that the engine mount be strong and well designed. But even the best quality mounts can cause problems if they’re not properly installed …. Damage to the rubber/polymer material, which can be caused by petroleum products, heat, age. Of the reasons listed, the one that most often causes engine mount failure and poor performance, is improper mount installation. It is certainly worth protecting your investment and making sure to avoid premature wear on the engine, prevent damage, and, most importantly to customers, improve overall passenger comfort and safety. Here are seven best practices to ensure a better fit and installation of your engine mounts. In some cases where the engine isn’t level, a spacing plate/wedge can be installed under the mount base. Do NOT post your engine bracket too high on the stud! The engine bracket is supported by the adjusting stud. Ideally, the engine bracket should sit somewhere in the middle of the mount’s adjusting stud. The adjusting stud allows for very small variations in alignment between the transmission’s output coupling and the propeller shaft coupling. The worst case scenario is when the engine bracket is set at the maximum height of adjustment. The higher the bracket sits on the adjusting stud, the more force from the propeller’s thrust, stressing the stud and risking a break. Over-extension can lead to broken studs, or failure due to thrust because the polymer core may deform. Isoflex height restrictive adjusters can alleviate this issue. Every engine mount with an AST Adjuster (Adjustable Swivel Top) or ANS Adjuster (Adjustable Nut Swivel) is labeled with a maximum allowable height. The adjusters allow for 4 degrees of bracket-to-bearer misalignment. Additionally, the compression fit increases the stud strength by three times. If, somehow, the bracket ends up too high on the stud, shim the mount up from the bottom to allow for a 10mm / 3/8” adjustments but DON’T USE WOOD, PLASTICS OR CHOCKING COMPOUND! Use non-compressible material such as steel, aluminum or fiberglass. Support the engine mounts properly. If necessary, build a bracket. Engines mounted on weak stringers can lead to transmission failures, because the most damaging part of the misalignment is being taken by the transmission coupling and the output shaft bearings. The transmission usually takes the blame, when the cause of the problem can actually be the hull. If you can’t install the engine mount directly on a stringer, build a strong, heavy-duty bracket that does not flex. Each mount must carry its fair share. Having drastically differently loaded engine mounts can cause an imbalance, resulting in poor isolation and premature failures. In fact, unevenly loaded mounts can cause more vibration rather than less, defeating the purpose of the engine mounts. The goal is to balance the weight of the engine and gear on each engine mount for the most even distribution, and especially between the port and starboard sides of each engine. The front mounts need to be within .5mm axial deflection of each other. The rear mounts need to be within .5mm axial deflection of each other. Don’t skimp on the hardware. Use the correct fasteners. When securing the mount to the stringer, stainless steel bolts and your average thin fender washers don’t have the tensile strength and rigidity needed for most mount uses. Fastening bolts should be grade 8 mild steel (instead of stainless) to handle the expected loads. Washers should be thick, heavy-duty and deformation resistant, especially in engine mounts with slots allowing for athwart ship adjustment. Ensure the right amount of tension. Use the appropriate wrenches. A torque wrench is the tool of choice for tensioning the engine mount fasteners. For the final adjustment (after alignment and load equalization have been done), use two wrenches/spanners: one to hold the adjusting nut steady and the other to tighten the lock nut. This will ensure proper tension between the nuts. Install on a squeaky clean surface. Mating surfaces should not be painted. Under heavy compression, even a thin layer of paint can cause a loss of tension, by cracking or squeezing out over time. Clean the engine bed of any debris or rust before installing the engine mount. It’s wise to inspect your engine mounts from time to time. Look at the stud, the polymer core, the nuts and the bolts attaching the mount base to the engine stringer, and the mount bracket, if used, to the engine. Look for excessive corrosion, or cracking of the polymer material. Then feel for any movement of the fasteners. If you keep the engine mounts clean, and don’t undergo shock load damage which can be seen in movement or wear of the mounting hardware to the stringer, your engine mounts will last a very long time.